The Southern Hemispheres of Umbriel, Titania, and Oberon. This is an impressive 1988 U.S. Geological Survey map of the southern hemispheres of Umbriel, Titania and Oberon, three of the Uranus' moons. The map contains three pairs of images. 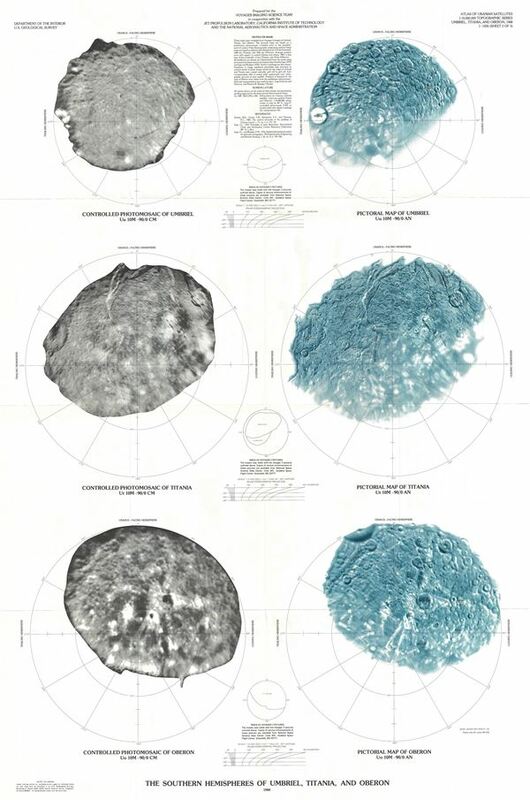 The first pair in the top section of the map depicts a photomosaic and a pictorial image of Umbriel, the third farthest of Uranus' five major moons. The Wunda crater, which is a ring of bright material and Umbriel's most striking feature, is identified here. The second pair of images in the center of the map represents a photomosaic and a pictorial image of Titania, the largest moon of Uranus. The Messina Chasma, a large canyon of the surface of Titania is identified here. The third pair of images in the bottom section of the map features the photomosaic and pictorial image of Oberon, the second largest and the outermost of the five major moons of Uranus. The largest crater on its surface, Hamlet, is identified in this map. This map is based on the images from the spacecraft Voyager 2, which helped map approximately 40% of the surface of these moons. The Voyager 2 spacecraft, launched in August 1977, is the only spacecraft to have explored Uranus and Neptune. Along with Voyager 1, its primary mission at the time of launch was to explore Jupiter and Saturn. Since then, the mission objectives have been extended to exploring the Solar System beyond the outer planets, as far as the Sun's sphere of influence and possibly even beyond the outer limits of our Solar System. It is also the only spacecraft to have studied all four giant planets of our Solar System at close range. Both space crafts are carrying a golden record explaining their origins and containing sounds and images portraying Earths life and its culture in all its diversity. Although departing the Solar System in different directions, both Voyagers have reached the Heliosheath, where the solar wind mixes with interstellar wind. This map was prepared for the Voyager Imaging Science Team in cooperation with the Jet Propulsion Laboratory, California Institute of Technology, and the National Aeronautics and Space Administration and published by the U.S. Geological Survey as Atlas of Uranian Satellites Topographic Series map I-1920 sheet 3.